Underwater - "This Is Not a Film"
This is the kind of album that takes a few listens before revealing itself. It's also an album best listened to in a quiet environment. The first time I listened to it was in the car while driving. This is not a driving album. 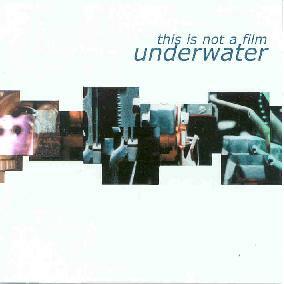 Underwater's This Is Not a Film, the second full-length album for the group, stands as a showcase for Melissa Mileski's vocal talents. The music is sparse and restrained, yet full of subtle complexity. But there would be little to it without Mileski's singing. She sings with a great yearning in her voice, a yearning that is at once sexual in its need, and at other times, driven by some hidden fear. The music meanders through spaced-out sonic textures, and gently rhythmic, almost industrial sounding excursions, with subtle melodic hints, and moments of organically sensual beauty. It reminded me, at times, of Kate Bush's mid-period, when she got very experimental on albums like The Dreaming (1982) and The Hounds of Love (1985), though Underwater's sound is not as outrageous or as energy driven as those works. This is nighttime listening, to be heard amongst the shadows, while thinking one's own private thoughts and gazing out at the sleeping world. More information can be found at http://www.submarinerecords.com/underwater/. Or by contacting Sub:marine records at: SUB:MARINE; P.O. BOX 5855; Atlanta, GA 31107. Tel./Fax: 404-373-9953.